In honor of Pauline, the contributions will help support the "reachout to the youth" program that will help fund events at the church for students at North Holland Elementary. Pauline Ebels Rouwhorst created countless beautiful things and moments while crafting close and enduring relationships throughout her 91 years of living in and around Holland, Michigan. She was an accomplished quilter and seamstress, sewing dresses for her daughters, as well as a gifted gardener who made every occasion special with striking floral arrangements and a God-given spirit of warm hospitality. She demonstrated the love of Jesus Christ to her family and strangers alike, befriending Spanish-speaking migrant workers who spent summers on the family’s farmstead in North Holland, and Japanese immigrants to the area soon after World War II. She believed in the grace of God and the value of hard and honest work. After completing 8th grade, Pauline took a job at a local grocer and helped her mother on the family farm. 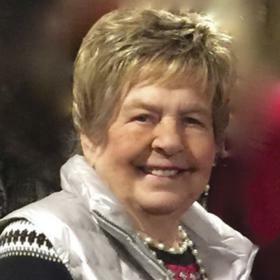 Later, she managed restaurants and a catering business, and served as a sales clerk at a number of Holland-area retail shops, enjoying the banter and friendship with customers. She grew up in the shadow of the North Holland Reformed Church, where she sang in the adult choir, directed the junior choir, led the Vacation Bible School and helped launch the Children in Worship program. Pauline and her late husband Claude Rouwhorst enjoyed 50 years of marriage before his death, bonding to raise a family while enjoying annual summer vacations at Big Star Lake, building carousel horses and playing countless rounds of golf. Her zest for living fully and faithfully is a legacy that will be remembered and emulated by friends and family for years to come. Pauline is survived by her four daughters, Nancy Rouwhorst, Bette Jo (Bob) Nienhuis, Paula (Bob) Ter Haar and Jan (Larry) Schutt; seven grandchildren, Rebecca (Mario) Franciscotty, Sarah (Scott) Sadler, Samuel (Jennifer) de Boer, Mitchiel (Candis) de Boer, Jacob (Stephanie) de Boer, Andrew (Kateri) Schutt and Janna (Jeff) Melville; twenty precious great-grandchildren who became her life’s greatest joy in her later years; her siblings, Jason (Esther) Ebels, Don (Nancy) Ebels, Mary Ebels, Bob (Marilyn) Ebels, Junior Hop, Ray (Cynthia) Rouwhorst, Hazel Bloemers, and Marilyn Rouwhorst; along with many special nieces and nephews. Preceding her in death along with her husband, were her siblings Bernard (Jean) Ebels, Annabelle (Floyd) VandenBelt, Glenndale Ebels, Maxine Hop, Jerry (Marian) Rouwhorst, Jay (Thelma) Rouwhorst, John Bloemers, and Vernon Rouwhorst. Visitation for Pauline will be on Wednesday April 11, from 5-8pm at Dykstra Funeral Home – Northwood Chapel, 295 Douglas Ave, Holland. A memorial service will take place on Thursday April 12, at 2:00pm at North Holland Reformed Church 12050 New Holland St, Holland. A private burial will be at Restlawn Memorial Gardens. In lieu of flowers, memorial contributions may be made to North Holland Reformed Church, where the contributions will be used to help fund sporting equipment for student ministries.